An Économusée is an artisan trade operation, which has been selected because of its commitment to quality and authenticity of traditional craft and art. TUTL is the first Économusée, based on musical traditions. traditional crafts and know-how and how these are kept alive. Here, you can learn about history, traditional techniques and contemporary products stamped with identity and originality. The mandate of the organisations is to develop the Économusées in the North Atlantic region. We offer an innovative cultural tourist product. Faroese music would now have disappeared. Since the earliest times, music has played a major role in Faroese culture. Today, the Faroese music scene is buzzing with artists of all genres. Artisans at work / Handverk í verki. Ballad songs in dance form and church singing were introduced to the Faroe Islands in the Middle Ages. At TUTL Économusée, we present the branches of music that are inspired by and grow these ethnic music roots as well as early instrumental folk music. Since the mid-1970s, TUTL Records - the Faroese musicians' label - has had a central role in releasing ethnic music from the Faroe Islands as well as creating a platform for all genres of music from the islands. TUTL has played a central role in the collection, preservation and dissemination of traditional Faroese music. 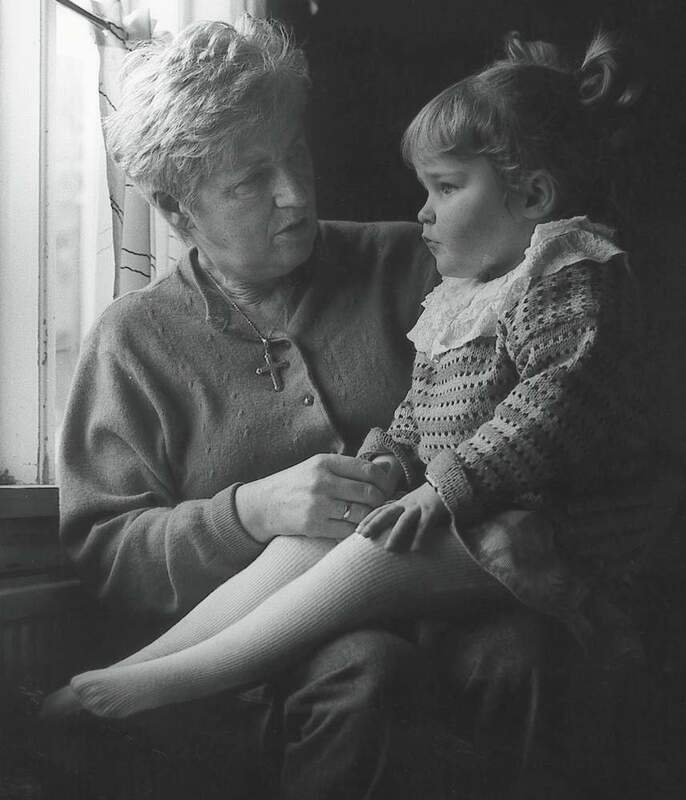 Without the work of TUTL, a great deal of the knowledge about the Faroese music tradition would have disappeared. Today, TUTL is the leading representative and distributor of Faroese music. 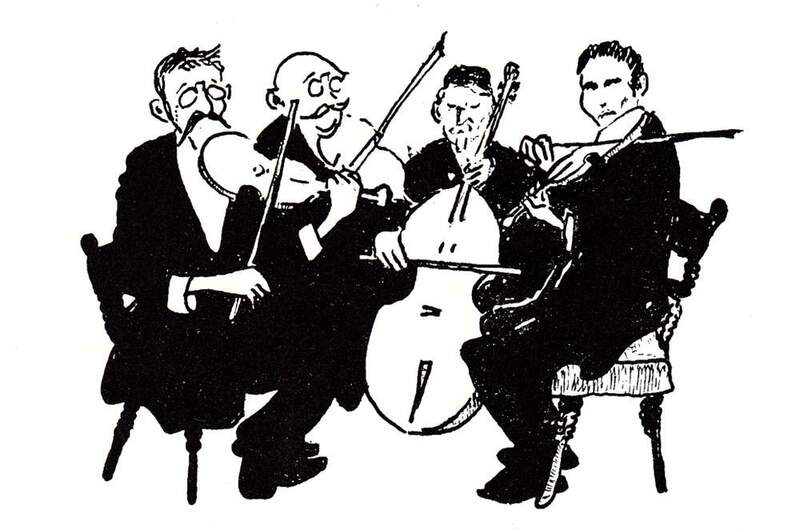 Since its establishment in the mid-1970s, TUTL has been an association collectively owned by musicians and composers, but in 2012, TUTL became a limited company. As an Économusée too, TUTL gives you the opportunity to hear Faroese music and learn about the local music culture and its history. TUTL also offers you the opportunity to hear and see authentic and original Faroese song and dance out in the settlements in the periphery, in churches and other sites. The Économusée concept of TUTL connects the activities in the capital and peripheral areas. It creates great opportunities for a complete experience, especially if you want to combine the visit with other Économusée-related Artisans in the rural areas of the Faroe Islands. TUTL was founded in 1977 by the renowned local artisan, jazz musician and composer Kristian Blak. Kristian's diverse musical background is reflected in the wide array of music he composes, uniting ethnic music with new compositional techniques. 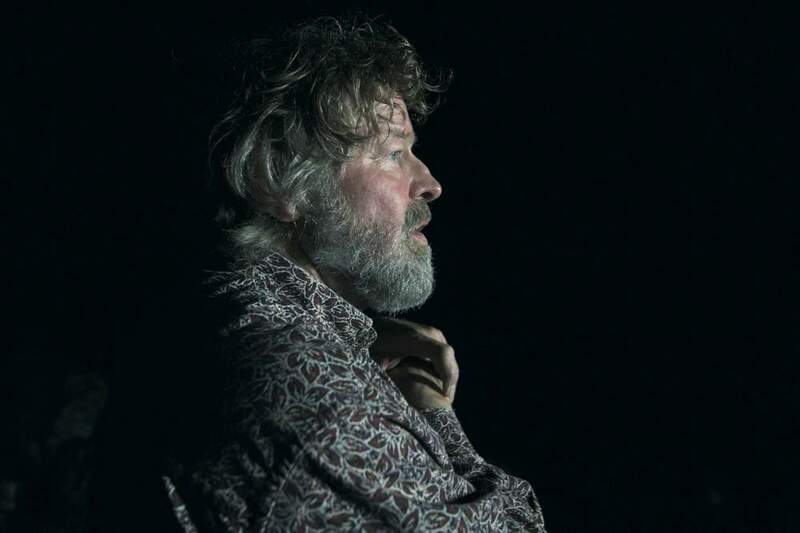 Born in the Danish peninsula of Jutland in 1947, Kristian relocated to the Faroe Islands in '74, where he's lived ever since, and where he's written the majority of his works. In addition to this, Kristian works as manager and CEO of the Tutl Records label and is artistic director of the popular annual Summartónar festival. 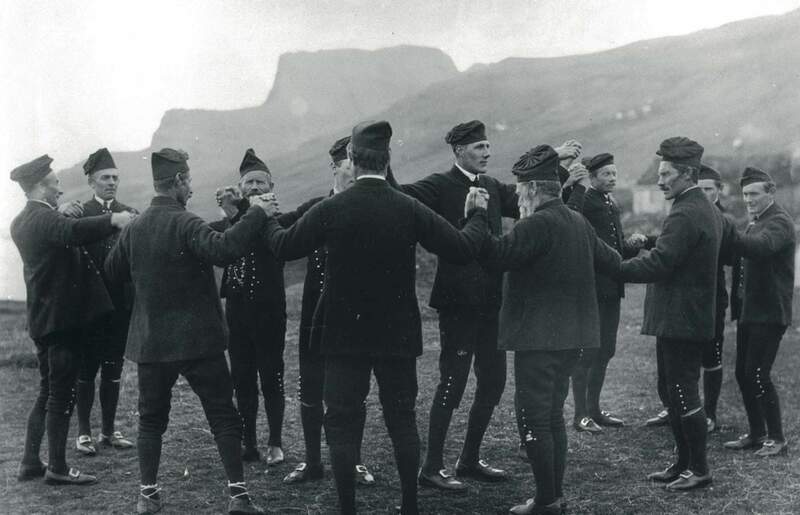 Islanders, dressed in the traditional national costume, performing the age-old Faroese chain/ring dance. The traditional Faroese national costume is a local handicraft that people spend a lot of time, money, and effort to assemble. This is worn at weddings, traditional dancing events, and on feast days. The cultural significance of the garment should not be underestimated both as an expression of local and national identity and a passing on and re-enforcing of traditional skills that bind local communities together. Ballad song in dance form became popular in the Faroe Islands in the Middle Ages. The songs are grouped as 'kvæði,' 'vísur,' and 'tættir.' These three forms differ from each other in content of the text, rhythm and melody. Dance is the element they all share. "Brókar táttur," performed by Dansifelagið í Havn. To buy recording, visit TUTL. The Faroese dance is performed in a closed ring. The dancers hold hands and dance facing inwards. The dance steps counts 6 main beats. This rhythm (stevið) is repeated continuously. The melodies, however, usually have a different rhythmic structure, for instance 4 and 3 beats, resulting in a polyrhythmic pattern. The Faroese dance tradition has been passed down for generations. The entire volume of the Faroese dance tradition is enormous: 75.000 verses were passed down in an unbroken oral tradition for centuries. You will find heroic, historic, satirical and love stories in the songs. The language in most of the songs is Faroese, although there are also several in Danish. A great part of the melodies are ancient, and musically directly connected to the Middle Ages. 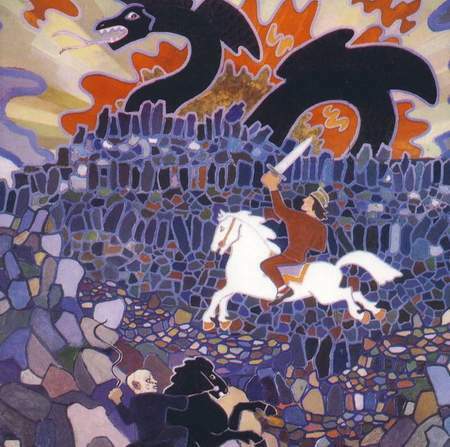 Illustration by William Heinesen on "Sjúrðarkvæði." The melodies and also the stories of the ballads have inspired artists since the first composers began writing songs and instrumental works in the Faroe Islands. For jazz, folk and rock musicians, the ancient tonality and rhythm can be successfully integrated in present day's music. Fiddling Faroes performing "Sinklars Vise." To buy recording, visit TUTL. Some write music directly based on existing songs, and others incorporate the musical language into their original compositions. Shalder Geo performing "Led Er Din Sang." Yggdrasil feat. Eivør: "Led Er Din Sang." To buy recording, visit TUTL. One of the most prolific and popular modern Faroese artists is Eivør. One of the most prolific and popular modern Faroese artists to do this in their musical approach is Eivør. 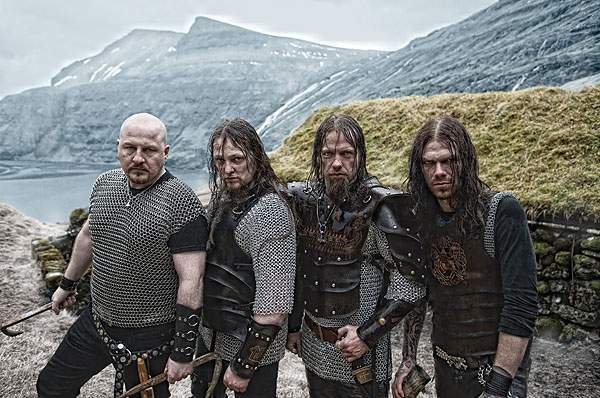 Faroese Viking metal band TÝR. The Viking metal band TÝR is another example of a style using both ways of music making. TÝR: "Hold The Heathen Hammer High." Video courtesy of Napalm Records. 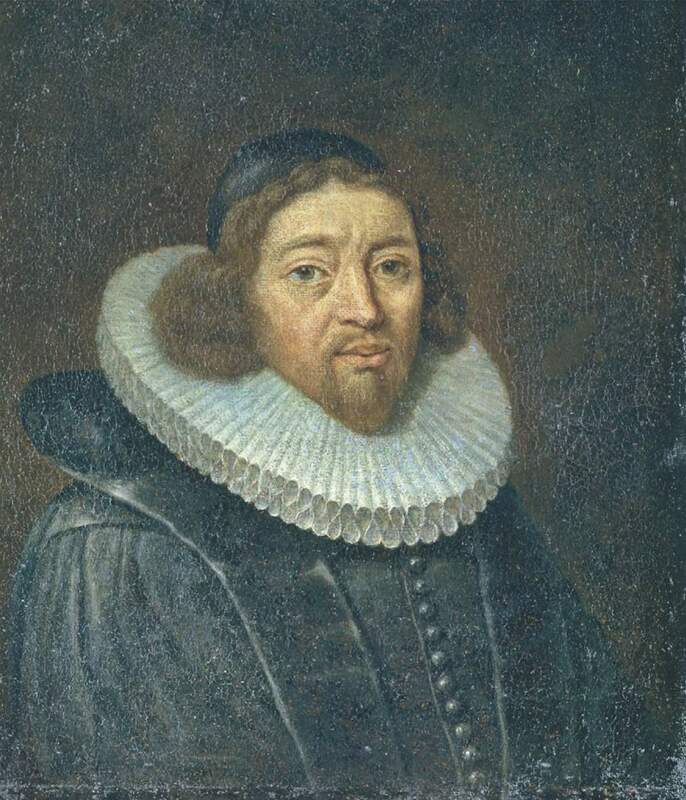 Portrait of Danish bishop, poet and hymn-writer Thomas Kingo. Church singing retained, even after the Reformation in 1537, many of the characteristics, which were introduced in Catholic times. These were developed in such a way that the hymn singing, usually named "Kingosálmar" or simply "Kingo" - named after Thomas Kingo's hymn book from 1699 - acquired its own national character. While, from a musical point of view, the strength of the Faroese dance lies in rhythm and drama, in "Kingosálmar," the strength lies in the wide range of melodic expression. To carry the musical storytelling of the Faroese dance, the melodies often have a repetition of notes. Although not unknown in "Kingosálmar," these are usually uncharacteristic for the hymn tunes. Traditionally, some hymns will have variations from village to village, or even use different melodies. Also individual ways of singing was common. In certain parts of the country, the melodies are very complicated particularly in the north of the Faroes, while in southern parts the melodies appear to be more closely akin to the northern European style of hymns. Marie Eide Petersen singing "Herre Gud, dit dyre navn og ære." To buy recording, visit TUTL. This old way of singing has been almost abandoned, superseded by more modern tunes accompanied by the organ. 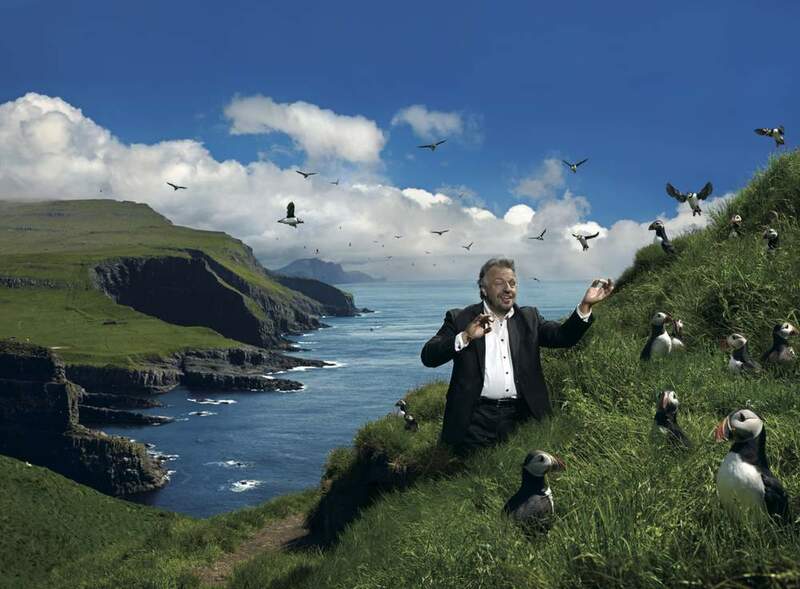 Fortunately, a great part of the Kingo singing tradition has been recorded and transcribed, to leave present Faroese artists with a vast source of inspiration. The language of the church was Danish well into the 20th century - both singing and preaching was in Danish. Many of the hymns have now been translated to Faroese, and present day artists use the original Danish texts as well as Faroese versions. The individuality we find in traditional Kingo singing lends itself in a natural way to improvisations. Hamferð take a new approach to the old Kingo tradition. 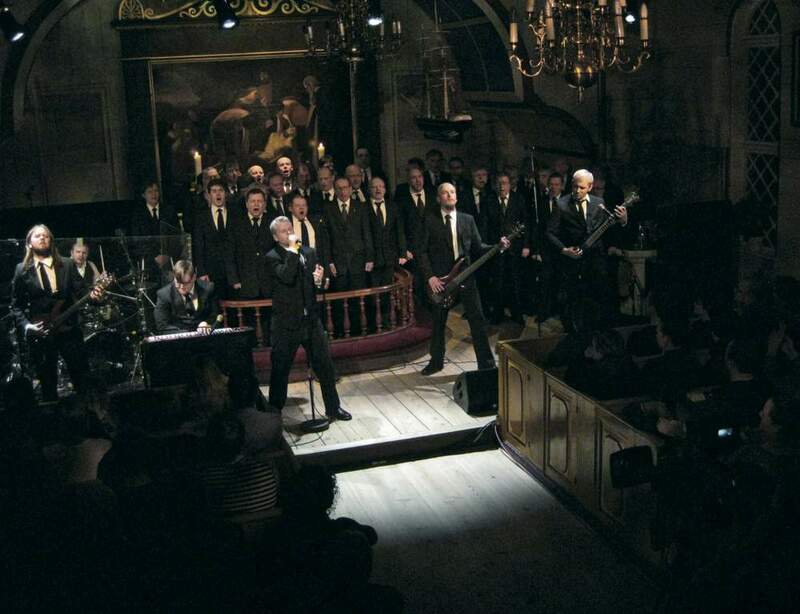 For instance, Hamferð, a doom metal band has recorded an acclaimed version of the Kingo hymn, "Harra Guð, títt dýra navn og æra," with Faroese lyrics. Their original compositions also have basic expressions in common with the slow and dark side of hymns. Hamferð: "Harra Guð Títt Dýra Navn Og Æra." To buy recording, visit TUTL. Skjaldur occupy a special place in the heart of Faroese music. 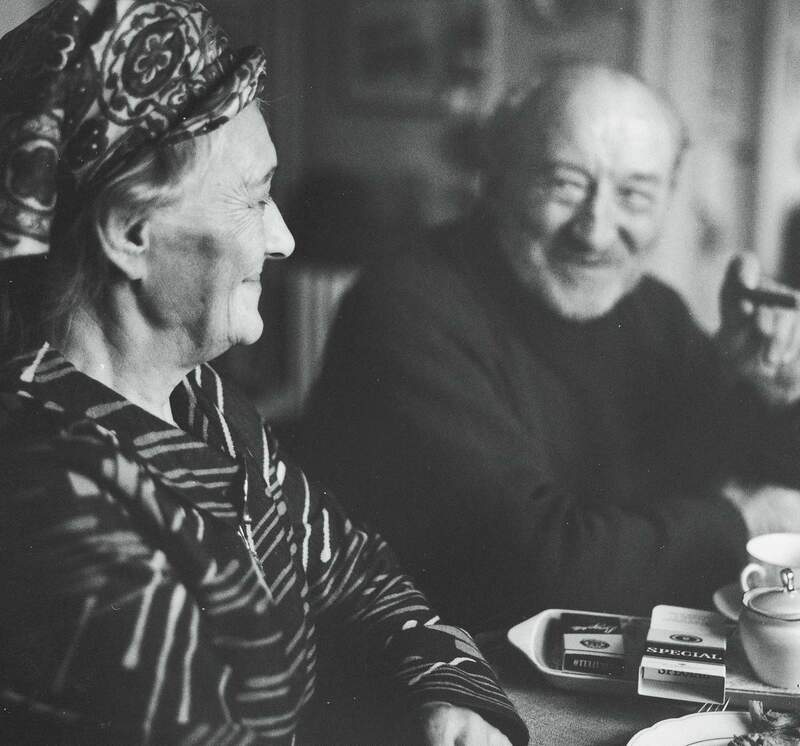 Portrait of William Heinesen - a nationally treasured poet, writer, composer and painter - sharing a tender moment with wife Elisa. "Skjaldur" - the third main type of traditional a capella music - are for the most part songs, sung by grown-ups for children. These "skjaldur" appear to have a different origin. They have perhaps been less influenced by Western European culture and represent more ethnically diverse forms of music. A fantasy world unfolds in the lyrics/words to these Faroese "skjaldur." The pictures, which they conjure up, appeal to the imagination of children and adults. They are full of magic spells, fairytale characters, trolls that were real enough in the daily life of long ago. Most "skjaldur" are quite short and sung without pauses - like a type of musical storytelling. 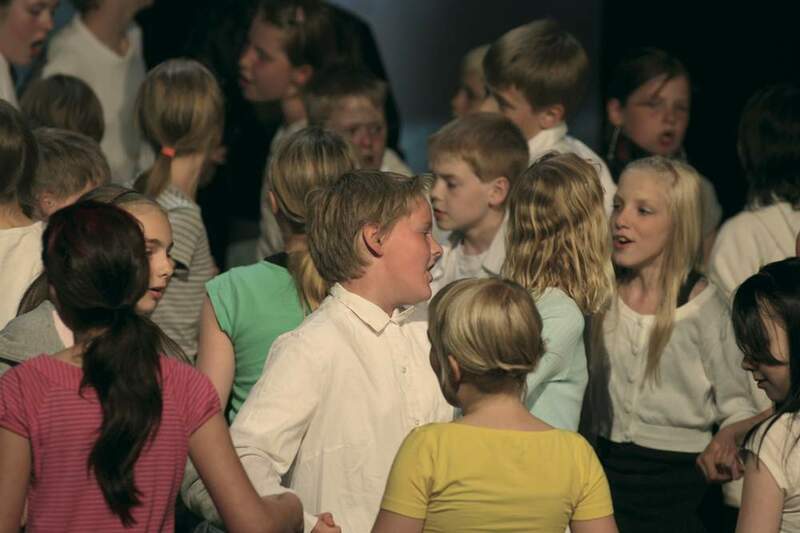 While the Faroese dance and "kingosangur" came to the Faroe Islands from the European courts and the Church, the "skjaldur" do not appear to belong to any music that came from the European centres of culture. The "skjaldur" are problaby an unaltered ethnic tradition, born not only out of the text, but also the structure of the melodies. The simplest "skjaldur" are pentatonic, i.e. there are only 5 different notes in the whole song. 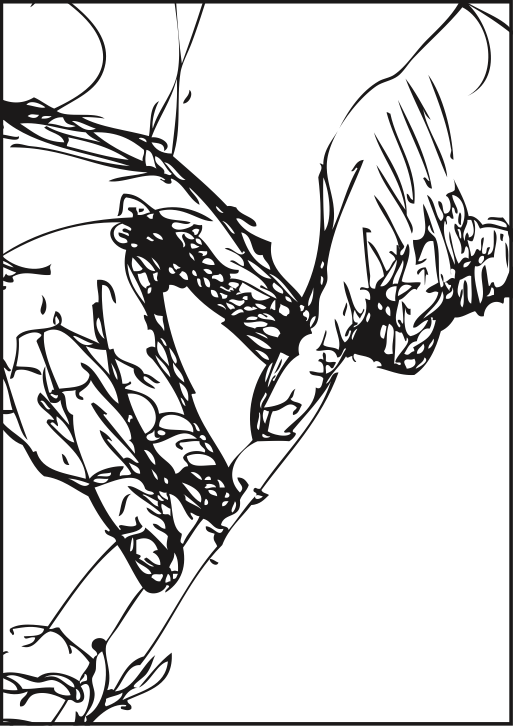 Other melodies make use of more notes, but still depend largely on the 5 notes. The pentatonic scale is found all over the world. To name a few: in Inuit, Scottish, Chinese, Native Indian music. The basic rhythm in the "skjaldur" is regular, as in the Faroese dance, but the pattern of beats is irregular. It follows the text. a 'skjaldur,' a traditional type of a cappella, sung by grown-ups for children. "Skjaldur" are usually sung by grown-ups - mother, father or other relatives - sitting with the child on their lap, singing. Not only does the "skjaldur" entertain, it has a soothing effect. The texts are in Faroese and do not lend themselves to translation with poetical and fantasy filled words. "Skjaldur," however, lend themselves very well to versions, including instruments, and many artists are intrepreting these traditional songs in new music. 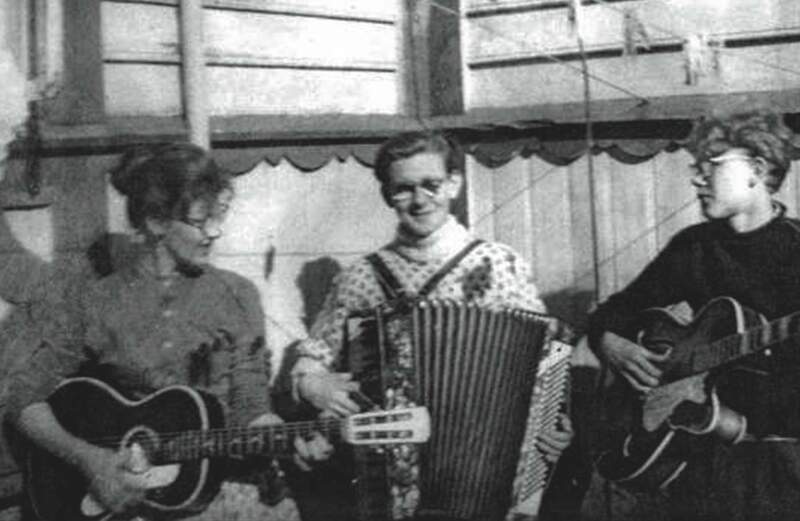 Nicolina, Áslakkur and Eyðbjørn - from one of the most popular Faroese folk groups, Tey av Kamarinum - pictured here in 1955. The Faroese ballad dance, "Kingosálmar" and "skjaldur" all have in common that they are vocal. There was one feature of music that was very late in coming to the Faroes; musical instruments were practically unknown for several centuries. Instruments such as harp and wind instruments are mentioned in the ballads, but there is nothing, which suggests that the instruments themselves were to be heard locally. 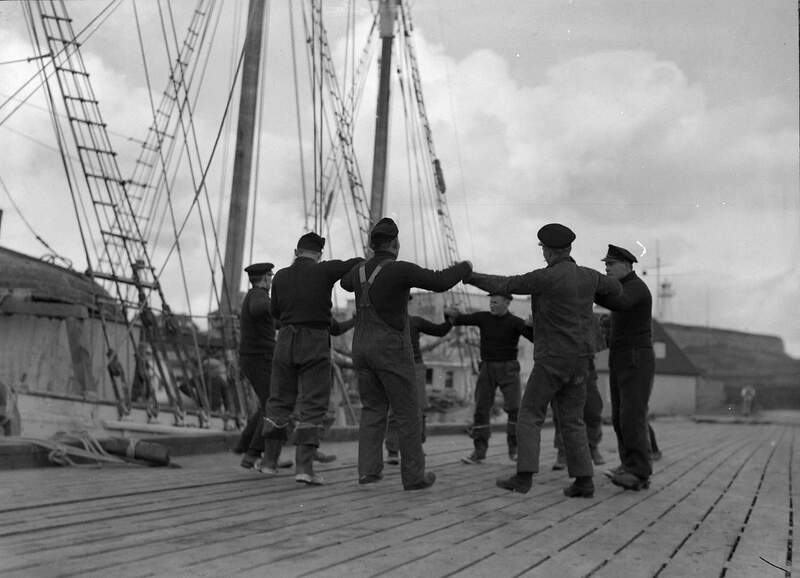 At fashionable weddings and on other festive occasions, particularly in Tórshavn, the Faroese dance is going out of fashion, and is being replaced by minuets, Polish, English, Scottish reels and figure dances. Jens Christian Svabo, "Indberetninger/Reports 1781 and 1782"
Svabo himself played the violin. A music book with dance tunes that he noted down and played from has been found, so this is an early example of instrumental music in the Faroes. The repertoire of Svabo was similar to that of many other folk musicians in Nordic countries in the late 18th century. Svabo lived for his last several years in Pætursastova in Tórshavn, where this book, originally dated 1775, was found as late as in 1928. Although best known for his linguistic work and description of Faroese society, he must have been an inspiration for folk and dance musicians. 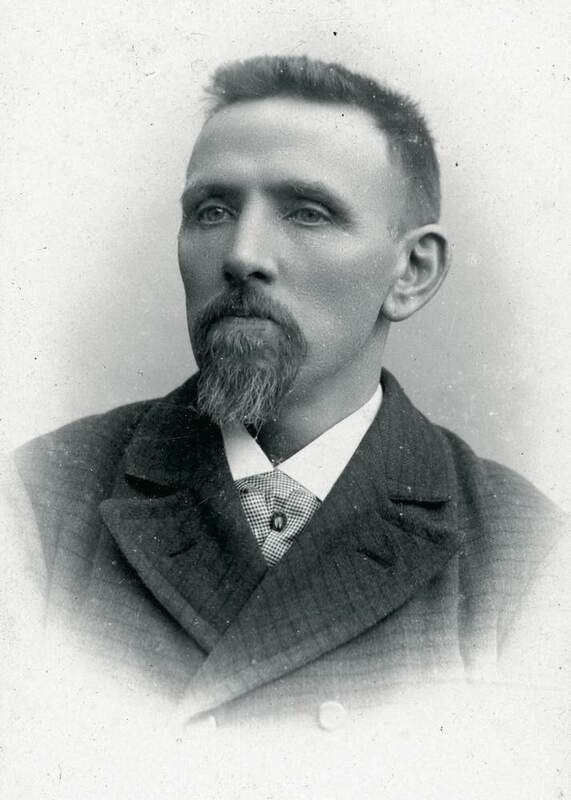 Another musician, Georg Hansen (1844-1924) aka Bakar Hansen, taught violin in particular, so in the late 19th century, there was a steady growing interest in instrumental music. In the early Faroese newspapers, letters were often featured from readers, arguing for and against the "snurredans"or "turning dances." It is important note that classical ensembles and brass bands had also been established by then. Illustration by William Heinesen: Bakar Hansen & Glataðu Spælimenninir. Up until recent years, most of the repertoire played at dances were standard northern Europeans polkas, waltzes, scottishes, not especially related to the Faroe Islands. 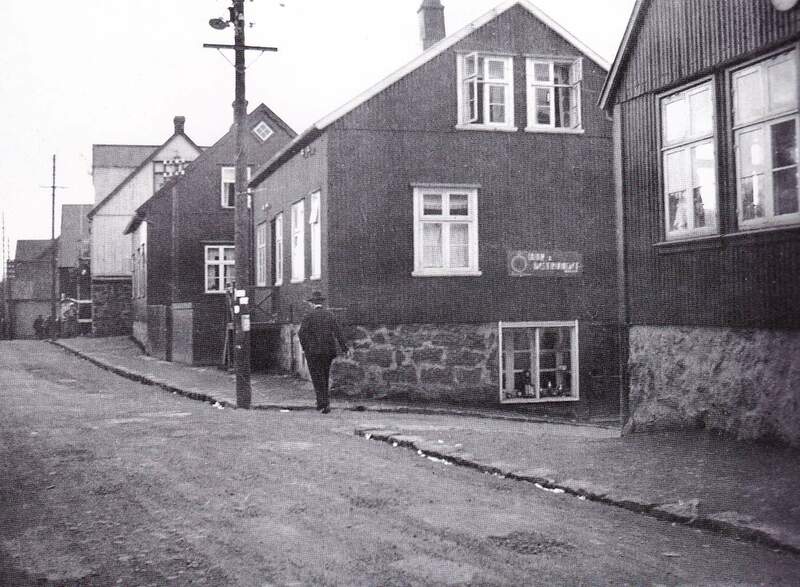 Visiting seamen, particularly from Norway, as well as Faroese seamen travelling abroad came home with new tunes to be enjoyed at the Faroese dance halls. 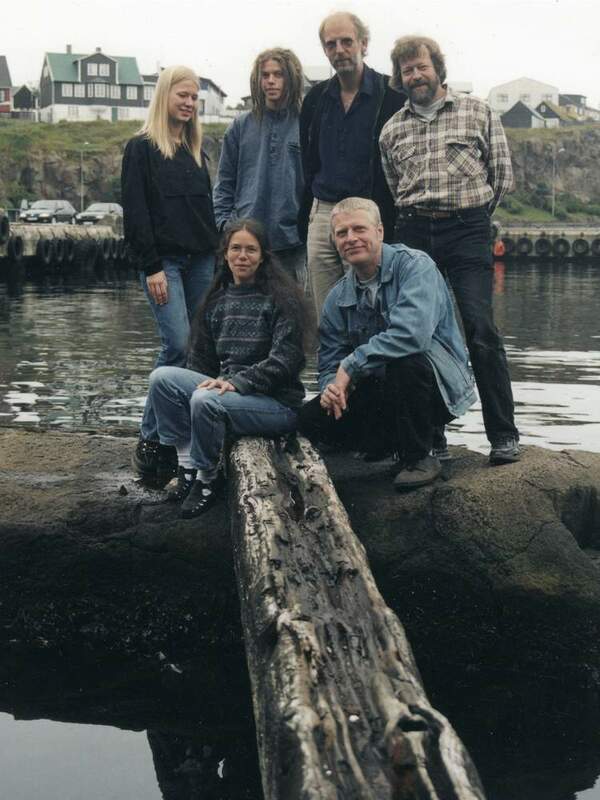 Below is a modern example from popular Faroese folk group Spælimenninir. Spælimennirnir: "Mars." To buy recording, visit TUTL. ORKA, formed by artist and producer Jens L. Thomsen, is one of the most innovative Faroese music acts around. 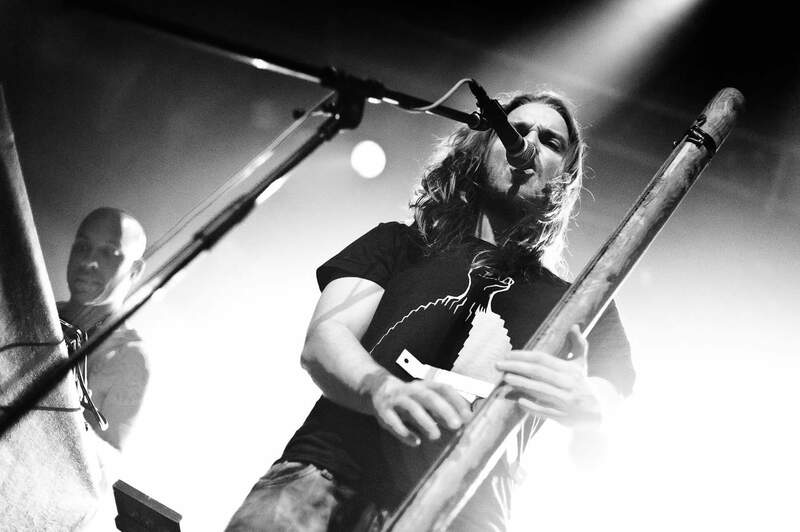 Building their own instruments is just one of the group's artisan trademarks. 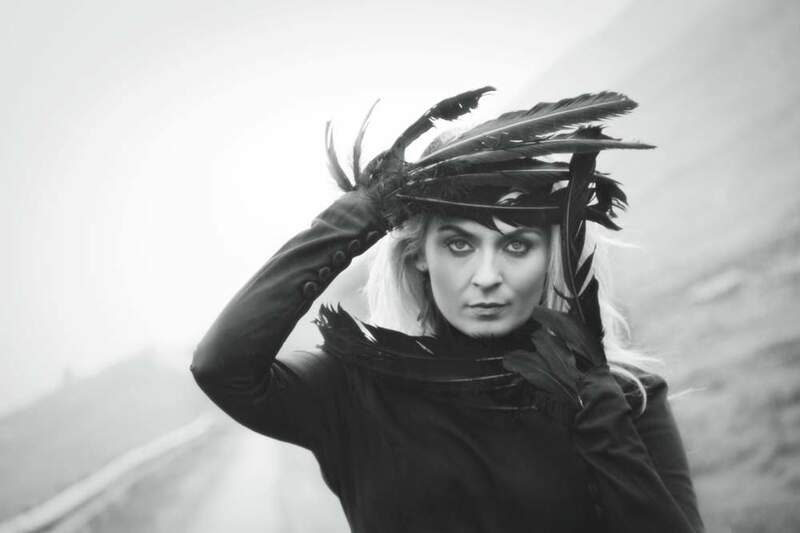 TUTL Économusée and the TUTL shop presents a rich opportunity to discover and experience live Faroese music and to explore the wide variety of genres that the musical islands have to offer - in the heart of Tórshavn. The TUTL shop is a lively music hub, situated on Niels Finsensgøta 9c or 'the Happy Corner' as it's also known, on the main of street in the capital. Stop by our shop to enjoy free coffee, friendly staff and a chat about the diverse Faroese music scene. During summer time, we arrange free live concerts weekdays at 4pm with Faroese musicians as well as a special guided TUTL Music Walk. Sign up and learn more about this on the TUTL website, in the TUTL shop or at Visit Tórshavn. Check out our Music Event Calendar for current information. Music as a souvenir - the TUTL shop is ideal if you're looking for unique gifts or souvenirs TAX-FREE! See more on TUTL Records at TUTL.com. Other Économusées in the Faroe Islands include: Mikkjal, the blacksmith, situated in Trøllanes - Mona, the wool spinnery, situated in Klaksvík - and The Boatbuilder við Ánna, situated in Tvøroyri.